Budding entrepreneurs thinking of starting a new retail venture at The Piece Hall need to act quickly as there are now only four units remaining which are already attracting strong interest. Anyone who has considered working for themselves and taking charge of their destiny could make 2019 their year. The beautiful and iconic Georgian building, which is now home to many independent businesses within its Grade I listed walls, has attracted fourteen new businesses since January 2018 alone. An eclectic range of independent shops, bars and the new Trust run 120-seater Trading Rooms restaurant and Bakery offer a unique and distinctive retail and leisure experience for visitors. The Piece Hall has recently been referred to as a ‘mecca for independent shopping’* and is regularly referenced as an important retail destination. Nicky Chance-Thompson, chief executive for The Piece Hall Trust, said: “Since re-opening in August last year, it is wonderful to be in the position where we are almost at capacity. One success story is Al’s Emporium, a family run vintage and antique furniture and collectables business, which has flourished in the space, expanding into larger units within months of opening. 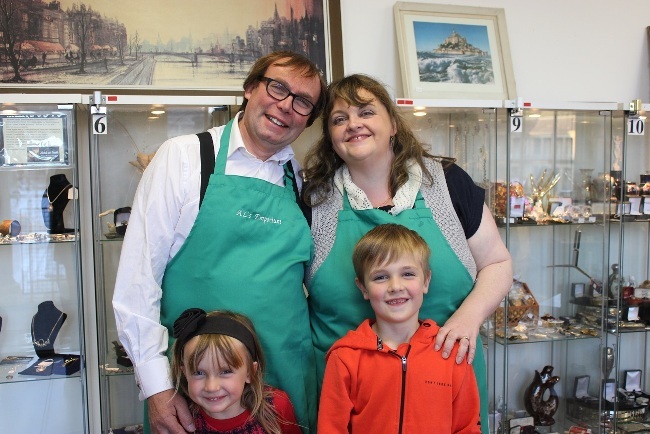 Owners Alan & Simone Sargent have seen increasing demand for their unique retail business model which rents cabinets to sellers and makers and was recently featured on BBC One’s Antiques Road Trip. Two existing businesses opened up additional premises this year in The Piece Hall, Totally Awesome, a successful toy shop in Hebden Bridge, and the long established Yorkshire Soap Company. Commercial Lead for The Piece Hall Trust, Nick Taylor, said: “The businesses that locate themselves here do it because they will be surrounded by other like-minded, supportive individuals who are keen to be part of a successful new era for The Piece Hall. “As a charitable Trust we work closely with each prospective tenant, at the business planning stage, to help them in the set-up phase, so that together we can build a thriving community of passionate, and distinctive retailers offering visitors to The Piece Hall a unique shopping, leisure and cultural experience. To contact the commercial team about the last remaining units, email nick.taylor@thepiecehall.co.uk or call 01422 525200.